Dowry system refers to the custumal or cultural practice that involves giving away of a large sum of cash, property and other valuables at the time of marriage by the parents of the bride to the family of the groom. “Gods reside there where women are worshiped”. Though we know of one ancient culture and quote the above quotation, but things are quite different in our society. Due to dowry system, the sacred affair of marriage is destroyed and it is turned into a business deal. The brides are placed in the same class as those of cattle. The ugliest thing about this system is that the richer the family of the bridegroom the higher is their demand. A marriage life that starts with such a business deal can never be happy. The parents of the brides are put to inhuman pressure for a handsome dowry in kind or cash whatever it may be. All the noble virtues of human beings like love, affection, sense of equality, liberal motive, gentleness, sympathy, kindness etc. are buried like rotten corpses. This system is found in both rich and poor community. 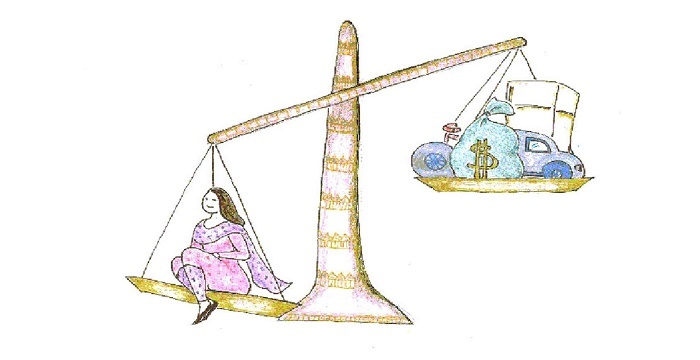 The Dowry System reduces the position and status of a woman. Boys and girls are reduced into a saleable commodity. The parents of well-established young men demand handsome dowry from the parents who want to marry his daughter to their son. And the man who can offer the highest dowry can secure the most deserving husband for his daughter. Many parents have to sell all their properties to get their daughters married. Again if the parents fail to pay the dowry at the time of marriage or after marriage, the brides have to suffer inhuman torture in their husband’s houses. As a result, some of these newly-wed brides have to commit suicide, some are put to death and some are compelled to file divorce suits. To root out this social evil mere laws, and by-laws or social enactment cannot be sufficient. Total change in the society is necessary at this moment. To eradicate this blot or stigma from the face of Indian society a number of measures need to be taken immediately. 1. Social Awareness: This is a social evil and we should tackle it socially. Social workers and social service organizations should also come forward to rouse public opinion against this evil system. They should organize anti-dowry campaigns throughout the country and people should boycott socially all those who accept or offer a dowry. The public and the media should form public opinion against the practice of dowry system in the country. Public awareness coupled with the efforts initiated by the government can combat the social evil of dowry in Indian society. 2. Women Empowerment and education: The women should be empowered and made self-sufficient by giving them proper education and employment so that they might grow conscious of their dignity and prestige and reject outright the young men whose parents demand dowry. Much of the problem of the dowry system will be solved if the girls and women folk in our Indian society can stand on their own feet financially. 3. Laws: The government must enact and enforce stringent laws prohibiting the evil practice of dowry in any of its form. No doubt, the ball has started rolling; a new atmosphere is being created. Social organizations have become much vocal and are denouncing this cursed system. In general, people also have become much more conscious. Let us all work together and put an end to this system. Nice lines to shaken the dormant society against the evils & perils of dowry system. But the need of the hour is to only mothfull of words will not be sufficient but to act in principle to be exampleray role models against the devil practice of dowry.